How do I choose the right post pregnancy belly wrap or garment for my situation and needs? Please visit our Belly Wrap Review page to find a detailed summary of the various belly wraps we stock as well as ratings for each, according to comfort, support, visibility, and longevity. When is the best time to measure myself for a Belly wrap? Once you are in your eighth month of pregnancy you will be about the same size as you will be post delivery. Therefore, this is the best time to measure. Simply measure around your tummy (over your belly button), and choose the corresponding wrap size. If you are purchasing a belly wrap just prior to delivery, measure yourself as above, and then subtract 8 – 12 cm’s from this measurement for the correct size. If you are still unsure, and want to save the potential hassle and cost of exchanging an incorrect size, please Contact us with your current measurement, stage of pregnancy, and pre-pregnancy dress size, and we can recommend the best size for you. I am between sizes or on the border of the sizing charts for one of the Belly wraps. Which size should I choose? If you are on the borderline or lower end of sizes, select the smaller size. You may need to wait a week or two to start wearing the wrap, however, it will have the same results. Alternatively, you can purchase one of each size if you want to wear your wrap immediately following delivery. If you are unsure, please contact us with your current measurement, pre-pregnancy dress size, and stage of pregnancy, so that we can recommend the best size for you. How long after a c-section before I can wear a belly wrap? Because having a c-section is a form of surgery, we always advise that you first check with your doctor or midwife before wearing a belly wrap. While there should be no issues with you wearing a postnatal wrap (in fact there are many benefits to wearing one post caesarean), if you have had any complications etc, you may just need to wait a little longer before you begin wrapping your tummy. If you are given the all clear, then we simply recommend you start wearing it as soon as you feel comfortable to do so. Which belly wrap is best for post c-section? Please visit our Caesarean Belly Wraps page to see which post pregnancy belly wrap brands we recommend for a c-section birth, and why. Will wearing a tummy wrap heal my diastasis recti? Diastasis recti is caused when the connective tissue (linea alba) holding the right and left halves of your abdominal muscles (rectus abdominis) stretches or tears. This stretching causes a gap between the muscle halves and can vary quite dramatically in size, and is the cause of the ‘mummy tummy bulge’. The idea of a belly wrap is to draw/compress the two halves of your muscle back to the spine which helps to reduce the size of a diastasis. However, it will not heal the connective tissue and completely close a diastasis. Does a post pregnancy belly wrap have to worn 24 hours a day? For maximum results, it is ideal to wear your belly wrap as much as possible in the first 8 weeks post birth. However, there will be no signigicant negative results if you choose to take it off every now and again to have a breather, or if you decide not to wear it of a night. In saying this, the results will be quicker and more dramatic the more you wear your wrap. At the end of the day – you need to be comfortable! so if the wrap is bothering you, take it off for a little rest every so often. Do I have to purchase 2 belly wraps? Most of the belly wrap companies will suggest you purchase 2 wraps so that you can continue wearing one while one is in the wash. The only reason we would suggest you purchase 2 wraps is if you happen to be on the borderline of sizes. The results of wearing a belly wrap will not be adversely affected if you choose not to wear one while you wash it or sleep. Where should I wear my postpartum belly wrap? A belly wrap is designed to compress your torn tummy muscles, therefore the idea is that your belly wrap covers this area. Ideally, it should cover your belly button, approximately 2 inches below, and approximately 2 inches above. To achieve this, we recommend you position your belly wrap just about level with your hips or just above your pubic bone. This reduces bulging belly below the wrap and reduces cutting in under your breasts if the wrap is being worn too high. Ultimately everyone’s body shape is different so you may want to move it up or down a little according to what is comfortable for you, however, just ensure the middle and lower section of your tummy is well covered. Can I wear a belly wrap & Shrinkx Hips at the same time? Absolutely! Because the Shrinkx Hips is worn low around your hips/pelvic area and a wrap is worn higher (just above your hips), there is no reason you cannot wear both products at the same time. That way the Shrinkx Hips will help get your hips back to their pre-pregnancy shape while the belly wrap helps compress your tummy back to its pre-pregnancy size. Can I wear a belly wrap to replace diet and exercise? Absolutely not. In fact, hopefully it will make new mothers more aware of their bodies and encourage them to eat a well-balanced, healthy diet, and exercise on a regular basis. How do I wash my belly wrap? It is recommended that all Belly Wraps sold on our website are hand washed and laid flat to dry. I had my baby over 2 months ago, will a belly wrap still help me? While wearing a belly wrap at any stage after having a baby will provide your core muscles with excellent support, the slimming effect will be greatly reduced if not worn within the first 6 weeks post birth. This is because the muscle wound is still fresh and more easily compressed just after delivery. It is still a terrific idea to wear a binder or wrap when you are exercising, and especially when carrying your baby in a front pack or sling, as this will provide excellent back support and help you gradually build a stronger core. Can I use an abdominal wrap after a caesarean section? Yes. Wearing an abdominal compression wrap after a c-section may actually decrease the post-operative recovery time by minimizing associated incision pain, which allows greater mobility post-surgery. Of course, consult with your physician before you do so. How do I get maximum results out of my belly wrap? The effectiveness of a belly wrap depends on it being worn soon after delivery (ideally no later than 4-6 weeks post birth), and by being worn consistently throughout the day (and night if you are comfortable) for 4-6 weeks. However, many mums will wear it much longer or keep it in the wardrobe for special occasions due to the slimming effect and support it offers. You can wear a wrap all day long, and even while you sleep. It’s most important that you feel comfortable while wearing it, but there are no restrictions as to how long throughout the day it can be worn. It’s not meant to be worn in water and therefore should be removed for baths and showers. When can I start wearing my belly wrap? A wrap can be worn within 24 hours of delivery, however, if you are unsure, please check with your physio or obstetrician first. You may also find that you want to wait a couple of days before wearing it, as you will be quite sore post birth. Please Note: A Belly Wrap is NOT to be worn during pregnancy. What is the purpose of a post pregnancy belly wrap? A Belly wrap compresses the portion of the body it’s wrapped around, forcing the lower back to straighten and taking tension off this area. By constricting the abdomen, the wrap provides better support and more confidence for the new mum recovering from her obstetrical experience. This compression of the tummy muscles will also help to reduce your diastasis (split muscles), allowing you to wear your pre-pregnancy clothes sooner. 8. Do you need to support a bad or severe diastasis recti? 7. Do you run or regularly exercise during your pregnancy? 6. Do you suffer from vulvar varicosities as well as back pain? 5. Do you like to apply heat therapy to your back during pregnancy? 4. Is your pain mainly due to pelvic or hip instability (SPD), is it very low in your back, or is your pain located more in the hip region? If yes, we would recommend the Baby Belly Abdominal belt. This is because this product is designed in such a way that it can be worn higher or lower according to where the support is needed most. 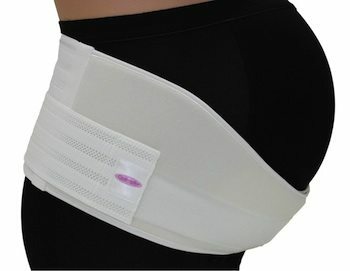 If you need to support your hips or pelvic area, you can comfortably wear this belt around this area. If you need to support your lower back, then you wear it around this area. 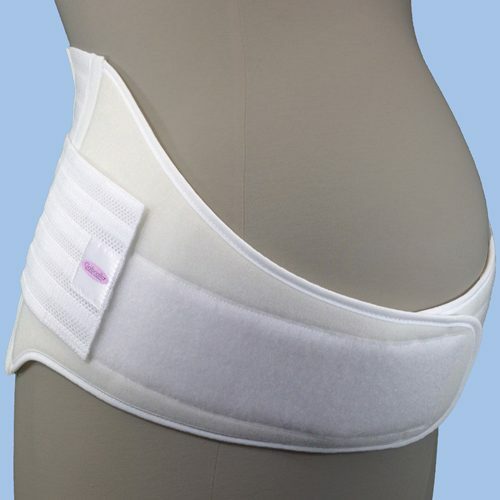 The other support belts can not be as easily or comfortably worn around the hip/pelvic region. 3. Are you pregnant with twins, experiencing severe back pain, or suffering from pre-existing back problems? If yes, we recommend the following support belts: If you answered yes to the above, are usually a size 6 or 8 pre-pregnancy, are a petite person, or have a short torso, then we would recommend the Gabrialla Deluxe, over the Gabrialla strong support belt. This is due to the Gabrialla strong support being much higher in the back than the Deluxe version. This extra height while usually a good thing, can make the belt more cumbersome on petite women, and less likely to fit as well and provide the level of support that it should. 2. Are you experiencing average to bad pregnancy back pain? 1. Are you only experiencing very minor back pain or just after a little lift for your belly, rather than structured support for back pain?